Hello Everyone! 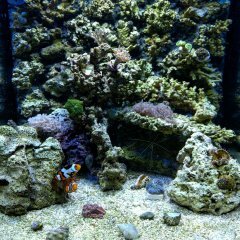 Let me introduce myself, I've been a long time lurker, with an occasional post in Beginner's Forum and finally want to setup an aquarium journal. So here goes... Started this tank as a gift for my wife's birthday, I think I am doing way more with it, she says, "Yep you do the maintenance and upkeep, I just enjoy it." We (I) wanted a Saltwater tank for a long time, said we would get a fish tank when we get our own house so we wouldn't have to move it. We got moved in in March and bought this tank beginning of April. 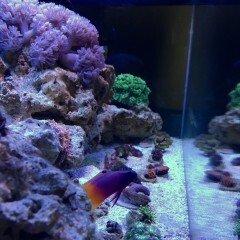 Back Story on the tank it was setup and running for six weeks at a local LFS so I bought it as a package that came with some credit for livestock. Pretty sure I overpaid and am kinda regretting not doing more research, i only did a bit of research ahead of time and talked with a friend that had a saltwater tank in his classroom where we both taught in Texas. Plus side I did avoid the long wait for it to cycle and those issues, although at same time that would have given me more of a feel for the tank. Anyway so here is the the setup. Setup: JBJ Nano-Cube 28g Professional LED - Running Stock everything in the back except took out the Ceramic rings and replaced with Rubble Rock. Hydor Koralia 425 - on advice from some folks on Beginner's Forum Finnex HMA 100W Heater - Not running in Summer 20 lbs of Live Sand 20 lbs of Live Rock with probably another 3-5 lbs on a Rockwall on the back of tank. Filtration: Stock with exception of Rubble Rock replacing the Ceramic rings as mentioned above. Chemi-Pure Elite in Bottom Chamber Fish: 2 - Clownfish (We believe Ocellaris, Wife picked out two that she thought looked cute.) 1 - Royal Gramma Want to add one or two more - was told could have ~5 Corals - All Bought as Frags Candy Cane Stylaphora (Told it was a Birdsnest) Brown Button Palys Frogspawn 2 Lord Acans 2 Florida Ricordea (1 Blue - 1 Orange(Multi-Color)) Miami Hurricane Chalice Green Star Polyps Green Rhodactis Mushroom Palythoa Grandis Zoas - 2 Different Kinds Pulsing Xenia - Came in on Live Rock, thought it had died but it came back, it's hidden in back for now. What I think is waving hand Xenia - Another that came in on Liverock tried to kill it by covering with another rock instead it's growing through the rock lol. CUC: Cleaner Skunk Shrimp - Not sure if he belongs here of with Fish (whatever) 3 - Nassarius Snails 3 - I think Nerite Snails 2 - Turbo Snails 1 - Conch Snail 3 - Hermit Crabs - Blue Legs 1 - Stomatella (Hitchhiker) Now what you all want, Pictures!!!!! FTS Current 7-8-17 6-1-17 FTS 5-16-17 FTS 5-3-17 FTS After Setup in House 4-1-17 Close up of some corals from 5-11-17 - More has been added Its a work in Progress, I really want some photosynthetic Gorgonians and a leather or two... Let me know what you think. Thanks! Hey guys! Reviving my old 12 gallon and it's going in the bedroom. Deciced to try black sand for this one and my first LED! Added water Tuesday. Can't wait to get this thing rolling!